Sweet Surprise! – That's StitchTastic! I love surprises, don’t you? Today I got an extra special one, and it just made my day. An acquaintance, who is the moderator on the Monthly Dishcloth KnitAlong Yahoo Group, announced that she was preparing to move, needed to clean out her yarn stash, and offered up 5 random skeins of yarn to whomever wanted it until her stash ran out. I was one of the lucky responders, and she shipped me some yarn. I have to admit I was a little giddy. I love yarn. For me going to a yarn store is like a kid going to a candy store. 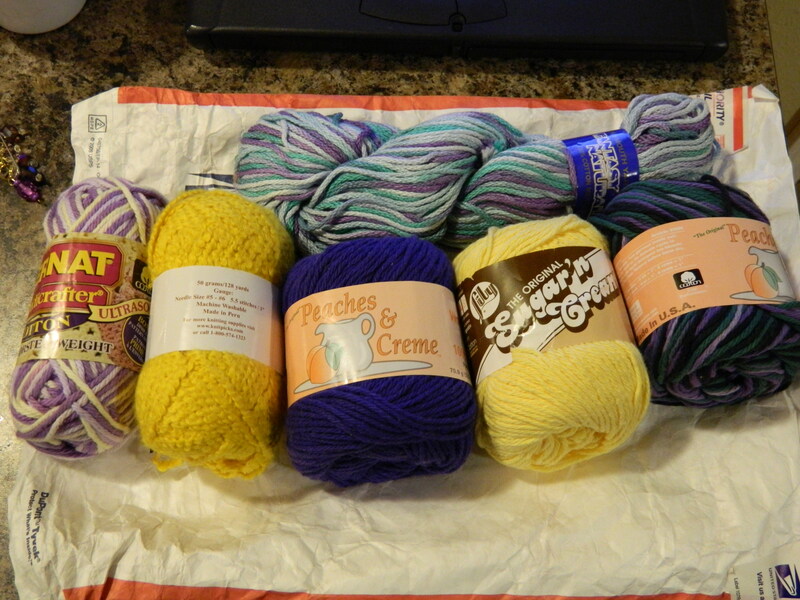 Knowing that yarn heading my way in the mail is like a toddler knowing Christmas is less than a week away. Today I opened up my PO box to find the package waiting for me, and when I got to the truck, I opened it up and this is what greeted me. Not 5 skeins of yarn, but 6 skeins! All in beautiful Purples, Blues, and Yellows. Perfect for my kitchen and bathrooms! When I got home to pull the skeins out and fondle them, I found an extra little surprise tucked into the bottom of the package. Yarn Bling. 5 beautiful hand-made stitch markers. Each one unique and special, but one definitely reflecting the personality of the giver. She lives near Vegas. 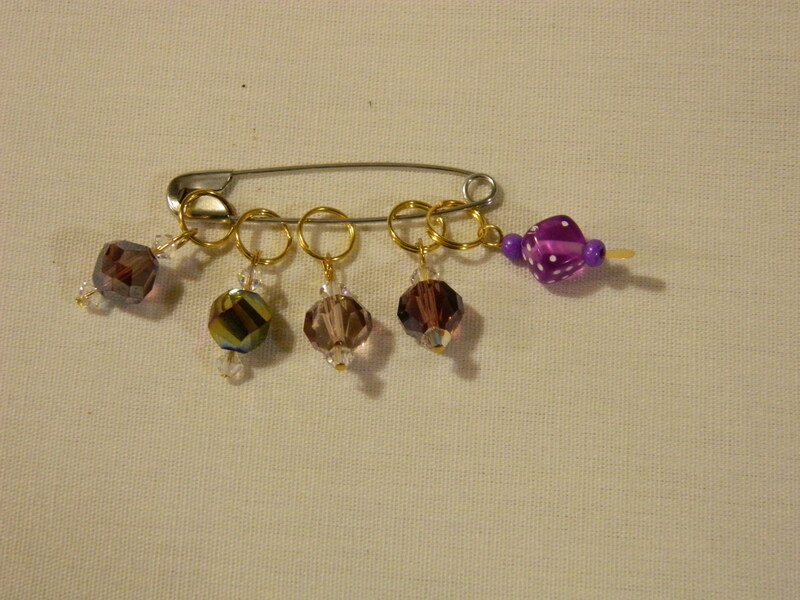 Can you guess which stitch marker I am referring to? And the yarn was extra special as well. There were a few skeins of the Peaches & Creme from the previous manufacturer (it is not made the same nowadays), and a skein of Knit Picks Crayon. This is much more than I expected to receive when I asked for 5 random skeins. But that is what I absolutely love about the knitting and crocheting. Most of the people in any knitting/crochet circle you come across are very generous, warm hearted, people and an asset to the community. Many knit for the simple enjoyment of knitting, and most of their creations are gifted to a loved one, or donated to a charity. And when one offers a part of their stash, that is extra special, because most knitters/crocheters know the true value of yarn. A yarn’s value isn’t just in the price that was paid for a skein or ball of yarn. A yarn’s value is in the potential creation it can become and the practical beauty that creation bring yourself or another. And when you get bling with yarn, that is just like getting extra frosting on a cupcake. Only it doesn’t add any extra inches to your waist. Yes, it is a sweet surprise indeed.